Unfortunately, my metabolism isn't what it used to be. I like to blame my husband, but it could be a result of old age as well. As a result - I - like fifty million other Americans, have decided to take another ride on the diet train. I'm going to participate in Weight Watchers Wednesdays (WWW) posting, like several of my favorite bloggers. Unfortunately, my WWW posts will be on Thursday because that's the day that we way in here in Ashley's town. I'm hoping to stay committed this time-- especially since I got one of my besties to join with me. It makes the meetings more amusing. Our leader happens to act like a chihuahua on speed, so it's nice to have a friend there to witness it and to roll eyes with. Now that I'm counting points, I just had to share some of the lovely goodies that I've been ingesting as of late (see, dieting is all bad). 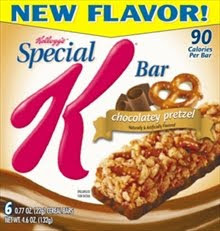 Kellog's Special K Bar in Chocolately Pretzel. The bar is tiny, but I feel like I'm eating a piece of heaven whenever I take a bite (2 WW pts). Arnold Sandwich Thins in EVERY flavor. These things ROCK. They are all the rage in the bread aisle and they taste 100 times better than plain ol' wonder bread. The best part-- both slices are only 1 point. I've been enjoying turkey sandwiches stuffed with deli mustard, lettuce, onions, sprouts and green peppers for 2 points all week. Oh my gosh, ya'll. This frozen meal is to die for. I almost didn't want to share it with you because I hate when this variety is sold out at my grocery store. 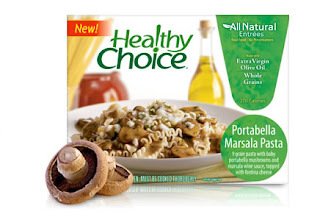 If you like mushrooms, run out and buy Healthy Choice's Portabella Marsala Pasta. It has a little bit of spice, it's made with whole wheat pasta, and there are huge chunks of real mushrooms in every bite. Whenever they are on sale I buy at least 10 boxes. What are your favorite "diet foods"? GASP! u said a flithy word! u said diet! :) i used to diet alot back in the day...i opted for a life style change this last yr :) lost over 115 pounds! I cut out alot of starchy foods and a good amount of carbs and i excersice 4 hours a day! I cut out fast food and alot of processed foods! Opted for making most of my stuff from scratch when i could :) good luck Ashley! I know u can do it! That Healthy Choice meal looks yummy! I may have to try to find it in my grocery store. A lot of the teachers I work with use that bread for their sandwiches and they love it. Good luck with your diet. I agree with Kira's comment above me. A lot of it comes down to making a lifestyle change so that it doesn't become a dreadful diet. Good luck! Portabella Marsala Pasta is the ONLY frozen dinner I will eat. It's the only one that doesn't taste like the packaging it was wrapped in. That healthy choice meal looks so good! I may have to pick some of those up tonight at the grocery store!! I love the South Beach-Protein Bars.. they taste really good.. and they are good to get you going in the mornings.. Cinnamon Raisin is my favorite.. I think I found your blog from Mama Kat but I'm not sure... nonetheless, I like it! I've lost 86 pounds by simply making small changes to my diet and exercising. I LOVE the Healthy Choice meal that you mentioned, I usually add some grilled chicken to up my protein intake but it's good with or without. One of my favorite healthier foods is "vita-top" muffins, have you heard of them? They're in the frozen breakfast section of my grocery store but I use them for dessert with some light ice cream on top... I prefer the chocolate. Good luck!